Chameleons bring together a wide range of personalities. Each person has their own story as to what got them started and why they have more than a passing interest in chameleons. 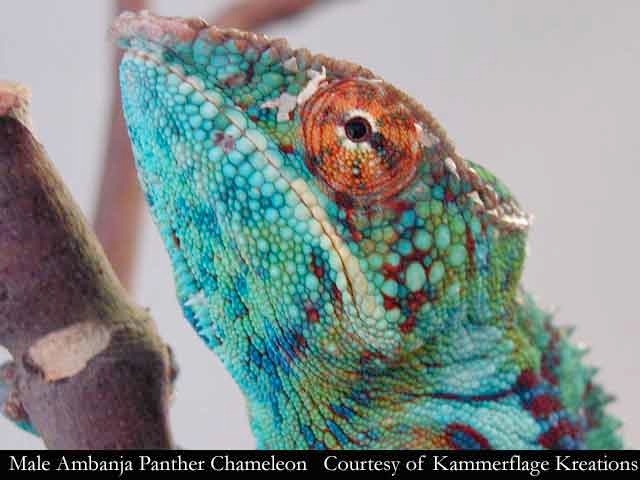 This article gives a personal account of the background behind Kammerflage Kreations - a business built on the captive breeding of chameleons - and the owners Ed and Liddy Kammer. In the words of the late Dizzy Dean, "who'd a thunk it?" Here I was an experienced herper, in my 18th year of running West Coast Reptile. During those years I had acquired a rather broad knowledge and an appreciation for a wide variety of herps. Yet, in one evening, my professional and personal life would change forever. While Liddy, my partner in life, business, and the mother of my children and I were having dinner with Philippe and Gigi de Vosjoli, Gigi produced a hatchling Veiled Chameleon on her index finger for Liddy to look at. Liddy, while having an appreciation for nature, was not a reptile aficionado. All it took was one look at the 2-day old Veiled and that was it . . . game over! Gigi, seeing the obvious wonder and amazement in Liddy's eyes said, "so, do you want her"? Of course she did and if I had put the kibosh on it, I would have made the Grinch look like Florence Nightingale! This is where it all began. Ironically, Liddy had mentioned from time to time over the previous couple of years, that she would like to raise a baby chameleon on the kitchen counter at home. I had discouraged her, saying that they were very labor intensive and not very hardy, so why get attached to something that probably would lead to frustration and heart break? My own experience with chameleons goes back to my early teens. While in the hospital with a staff infection, my mom bought me a young male Jackson's Chameleon, to cheer me up. She was able to show him to me through my hospital window, but I was not allowed to hold it. Talk about motivation for healing, I couldn't wait to get home! It was the most fascinating creature I had ever owned, which is saying a lot, since my stockpile of assorted pets was so extensive, that my elementary school would take field trips to my house! At that time there was little written information on the keeping of chameleons and so despite lots of love, my chameleon eventually succumbed to my inexperienced care. After that I tried a few others, all with inevitable failure and that quenched my enthusiasm for quite a while. Later, at the age of 19, I became the owner of West Coast Reptile, a wholesale distributor in Huntington Beach, California. It was during the following 18 years that I became reacquainted with chameleons. 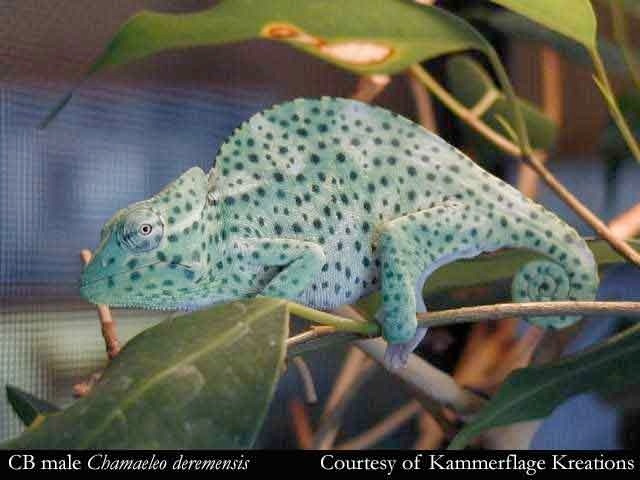 During much of that time, there was still an overall lack of good information, coupled with the fact that many of the imported chameleons did not arrive in very good shape. As a businessman, I determined that chameleons, on the whole, were not a good bet for my pet store customers or me and I carried them only occasionally. I would do my best to steer my customers away from chameleons, telling them they were too fragile. As time passed, countries would open and close and new chameleons would come onto the market, but my negative view did not change. It would take a twinkle in my wife's eye to get me to revisit my old assumptions about chameleons. It was her joy and enthusiasm that got me to take another, "much closer look" and before long I was sucked into the vortex. I discovered a hidden passion that had never been allowed to come to the surface. In our 14 years of marriage Liddy and I were very good at balancing each other out, but now, we both had twinkles in our eyes. Since neither of us could find the brake pedal, we rapidly began the expansion of our collection and before long our chameleons were making babies. We went from that "one" cage on the kitchen counter to 20 cages occupying various nooks throughout our home in a matter of weeks! Then 20 became 50 and so on. I knew that I was too far-gone, when I considered getting a bunk bed for our two kids, so we could take over one of their rooms! OK, it was just a passing thought, but you fellow chameleon junkies may perhaps relate. 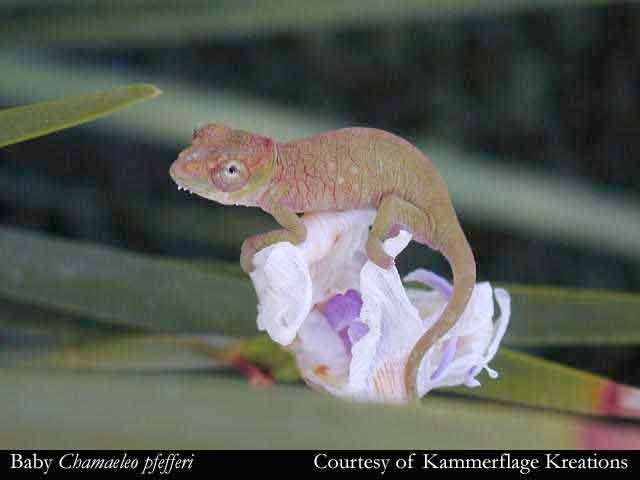 During my personal renaissance of opinion on chameleons, I discovered many interesting things. In our search for information, there seemed to be two camps of thought among those people who were experienced chameleon keepers: Those who were weary, discouraged and burned out and others who were "battle scared", yet undaunted . . . possessing a wealth of experience that they were (in most cases) willing to share. Liddy and I have had the great advantage of coming into this field after so many others had gone before us. Their experiences have been invaluable to us and without them our success would have been greatly diminished. 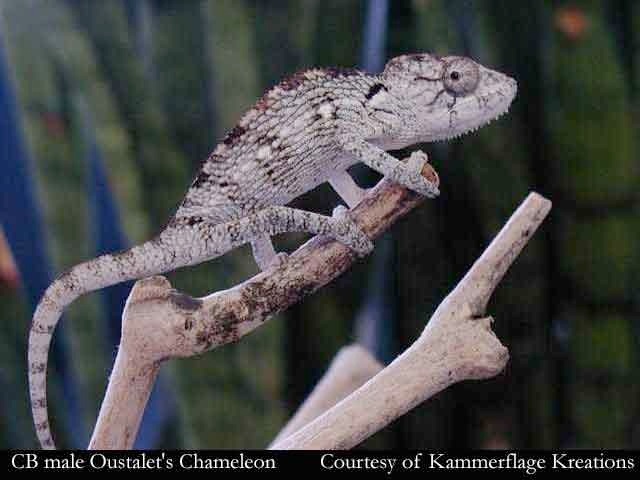 Once armed with substantially better care information than in my formative years, I discovered that a healthy captive bred chameleon, with its needs adequately provided for, was actually quite hardy. In addition, imports which were in decent shape, allowed proper acclimation and provided with necessary medical care, were far from impossible. As our collection expanded it became clear we would need an outlet for our offspring. Not an easy proposition since Liddy wanted to keep them all! Since the kids did not like the bunk bed idea, we decided that a web site might be a good way to find other "chameleon people". More surprises . . . after 14 years of marriage, my wife discovered a latent talent for web design and photography. Voila! Kammerflage Kreations was born. The response has been overwhelming and we have met a tremendous array of people from all walks of life, sharing a common interest . . . chameleons. We have been extremely impressed by the quality of customers who are drawn to these magnificent creatures. In almost every instance we have found people eager to learn about the species they wish to obtain (before they buy it!) and willing to provide everything their new charge will require . . . it has been a breath of fresh air and a great encouragement to us, since we want all our "kids" to find good homes. 1. Select a good beginner species such as a Panther, Oustalet's or Veiled. Once you have success with one of these, it will be easier to succeed with other varieties. 2. 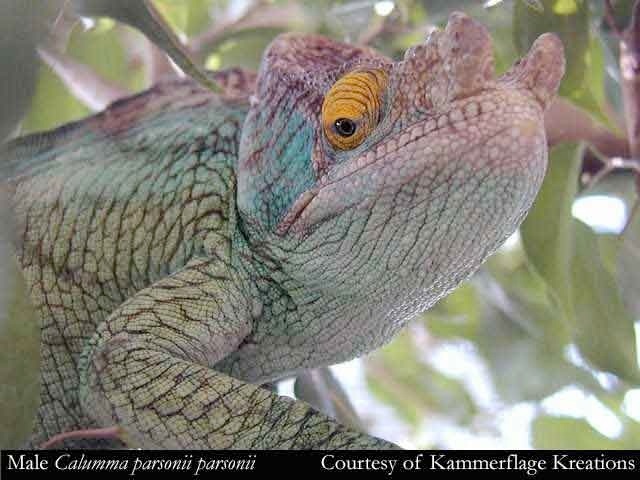 Do your homework on general chameleon care and on that particular species. "An ounce of prevention is worth a pound of cure." 3. Once you discover the needs of the chameleon you want, be honest with yourself regarding your willingness and ability to commit to its proper care. 4. Obtain all necessary caging and accessories BEFORE you acquire your chameleon. 5. If you wish to optimize your chances for success, buy a captive born chameleon rather than wild caught. The difference is night to day! 6. If you take my good advice in point 5, then seek a reputable breeder you can trust and feel comfortable with. 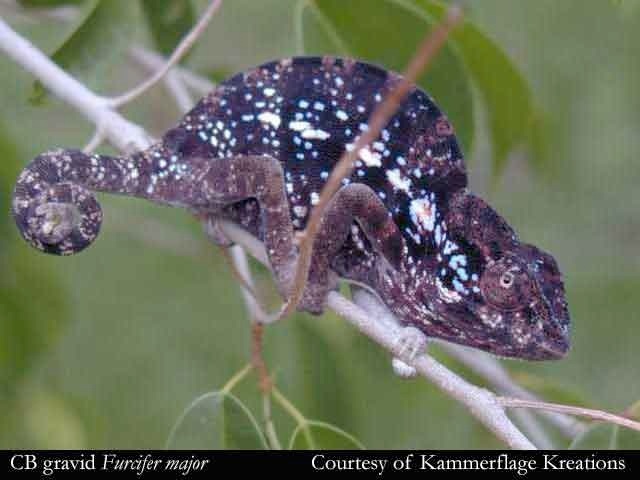 Ask around, go to online chameleon list serves; it should not be too hard to find one. Follow the above steps and prepare to enjoy one of the most unique creatures you will ever encounter! Nearly four years have passed since our dinner with Philippe and Gigi. 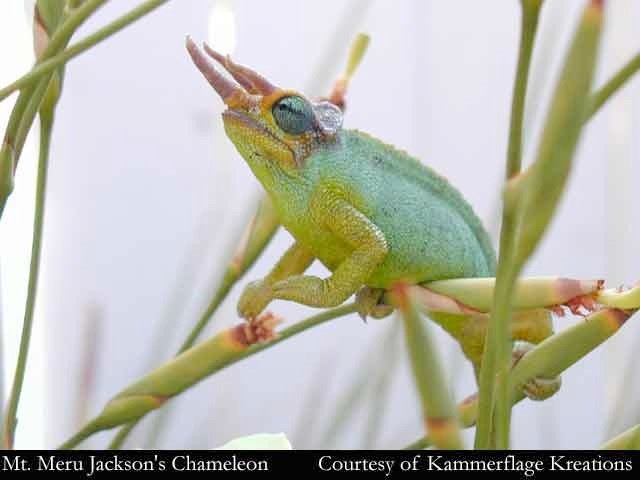 We are currently working with 16 species of chameleons. Our joy and enthusiasm continues to grow. We feel like we've learned a lot, but there's so much we do not yet know. Yes, there are frustrations and heartbreaks, but as the saying goes "if it doesn't kill us, it will make us stronger". I'm grateful for the friend who inspired that twinkle in Liddy's eyes and grateful that I finally know what I want to do when I grow up. Ed and Liddy may be reached at info@chameleonsonly.com or through their website www.chameleonsonly.com.